Captain Charles runs a 27-foot Capehorn that specializes in spearfishing and deep sea fishing charters in the Destin Gulf waters. The vessel holds a fishing permit for both federal and state waters! Passengers are not required to possess a Florida saltwater fishing license to spearfish or fish from the Blue Water Escape. 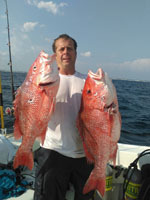 This charter offers a variety of spearfishing, recreational diving, and fishing opportunities. The boat can carry up to six (6) passengers. 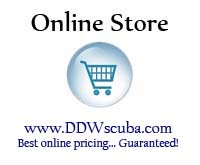 From entry-level scuba diving trips to advanced trips for spearfishing or deepwater underwater photography, to deep sea fishing... the charter has hundreds of scuba, spearfishing and fishing locations available. These sites include natural limestone reefs, dozens of wrecks and a variety of smaller artificial reefs that include airplanes, tanks, recycled materials and purpose-built fish habitat. If you're looking for a unique charter experience, you have found it with Blue Water Escape dive charters!